A male client is admitted for treatment of the syndrome of inappropriate antidiuretic hormone secretion (SIADH). For which electrolyte irregularity will the nurse be certain to monitor? Option D: Prioritization. Due to an excessive water retention, SIADH causes a relative sodium deficit. The nurse just received the client's morning laboratory results. Which of these results is of most concern? 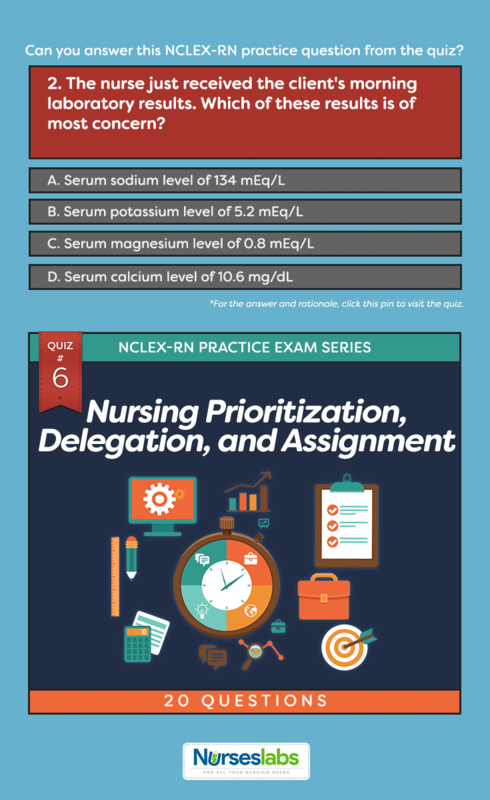 Answer: C. Serum magnesium level of 0.8 mEq/LOption C: Prioritization. With a magnesium level this low, the client is at risk for ECG changes and life-threatening ventricular dysrhythmias. Options A, B, and D: All of these values are also outside of the normal range, but the magnesium level is furthest from the normal values. The assigned LPN of the unit reports to you that a client's blood pressure and heart rate have decreased, and when her face is assessed, one side twitches. What is the most appropriate thing to do as a nurse? Option C: Prioritization. Facial twitching of one side of the mouth, nose, and cheek in response to tapping the face just below and in front of the ear is a positive Chvostek sign. It is a neurologic manifestation of hypocalcemia. Option D: The LPN is experienced and holds the skills to carefully and accurately measure vital signs. A client going through intense chemotherapy treatment is admitted to the unit. Which of these would the nurse instruct the nursing assistant to report to prevent an acid-base imbalance? Failure to eat all the food on the breakfast tray. Prolonged episodes of nausea and vomiting. Option D: Prioritization, supervision. Repeated nausea and vomiting can lead to an acid deficit and metabolic alkalosis. Options A, B, and C: The other options are vital and still need to be assessed, but are not related to acid-base problems. An anxious client is rushed to your unit. The vital signs measurements include a respiratory rate of 39 breaths/min. Which acid-base imbalance should the nurse suspect? Option A: Prioritization, supervision. The client is blowing off carbon dioxide and is most likely hyperventilating. A sudden drop of carbon dioxide will result in an increase in pH and cause respiratory alkalosis. Option B: Delegation, supervision. A well-trained and educated nursing assistant is knowledgeable in measuring vital signs and recording intake and output. Option A: Performing fingerstick glucose checks and assessing clients demands further education and skill, as possessed by licensed nurses. A client is admitted to the unit with the diagnosis of Deficient Fluid Volume related to excessive fluid loss. Which action related to fluid management should be charged to a nursing assistant? Option C: Delegation, supervision. Additional fluid intake can be reinforced by the nursing assistance once it is part of the care plan. Options A, B, and D: Administering IV fluids, developing plans, and educating families demand further education and skills that are within the field of practice of an RN. A group of nursing students is assigned to care for a client with a nasogastric tube connected to a wall suction. One student asks why the client's respiratory rate has decreased. Choose the best response. "Whenever a client develops a respiratory acid-base problem, decreasing the respiratory rate helps fix the problem." "The client is hypoventilating because of anxiety, and we will have to stay observant for the development of respiratory acidosis." "It's common for clients with uncomfortable equipment such as nasogastric tubes to have a lower rate of breathing." "The client may have a metabolic alkalosis due to the nasogastric suctioning, and the decreased respiratory rate is a compensatory mechanism." Option D: Supervision, prioritization. Nasogastric suctioning can result in a decrease in acid components and a metabolic alkalosis. The client's decrease in rate and depth of ventilation is an attempt to compensate by retaining carbon dioxide. Options A and B: These responses are incorrect. Option C: This response may be right, but it does not discuss all the components of the question. A 56-year-old male is newly admitted to the medical unit. Which factor alerts the nurse that this client has a risk for acid-base imbalances? The client takes antacids for occasional indigestion. The client gets short of breath with extreme exertion. The client has a history of myocardial infarction 1 year ago. The client has chronic renal insufficiency. Option D: Prioritization. Chronic renal disease and pulmonary disease are risk factors for acid-base imbalances in the older adult. Option A: Although antacid abuse is a risk factor for metabolic alkalosis, occasional antacid use will not cause imbalances. The monitor watcher from the telemetry units informs the assigned nurse that the client developed prominent U waves. 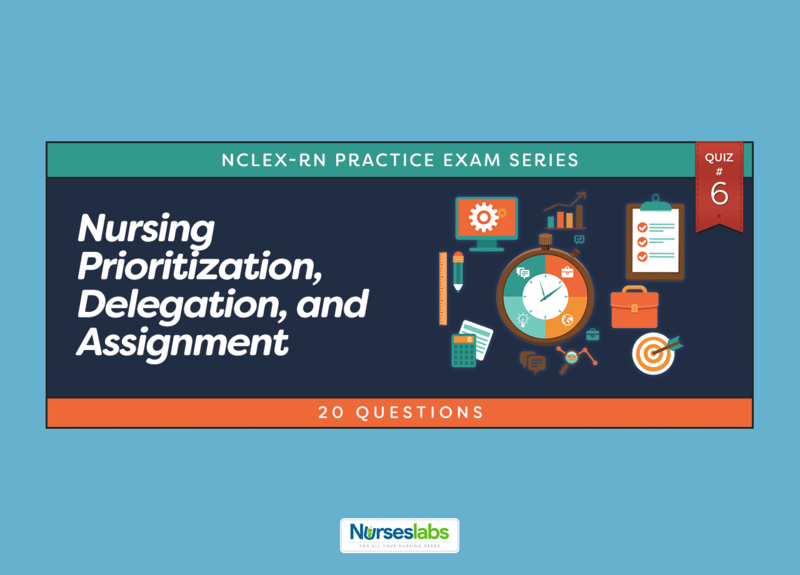 Which laboratory value should the nurse monitor? Option B: Prioritization. The nurse should immediately check the client's potassium level for hypokalemia. Common ECG changes with hypokalemia include ST depression, inverted T waves, and prominent U waves. Heart block may also transpire to clients with hypokalemia. The physician prescribed hydrochlorothiazide (HCTZ, Microzide) 10 mg orally for the client to take every day. What should you be sure to include in a teaching plan for this drug? (Select all that apply.)1. "Take this prescription in the morning." 2. "You should anticipate your urine output to increase." 3. "Notify your prescriber if you notice weight gain or increased swelling." 4. "This medication should be taken in 2 divided doses when you get up and when you go to bed." 5. "Eat foods with extra sodium every day." Option D: Prioritization. HCTZ is under thiazide diuretics. It should not be taken at night because it will cause the client to awaken and go to the toilet to urinate. Weight gain and increased edema should not transpire while the client is using this drug, so this should be reported to the prescriber. Option A: This type of diuretic causes potassium depletion, so the nurse should educate the client about eating foods rich in potassium. 12. For a client taking HCTZ, which blood test result would the nurse monitor? Option B: Prioritization. Potassium level should be monitored regularly because potassium depletion is expected when a client is taking HCTZ. A client is admitted to the unit with the nursing diagnosis of Decreased Cardiac Output related to decreased plasma volume. Which assessment finding supports this nursing diagnosis? Option B: Prioritization. Neck veins are usually distended when the client is in the supine position. These veins flatten as the client moves to sitting position. Options A, C, and D: These responses are characteristic of the nursing diagnosis of Excess Fluid Volume. Option D: Assignment, delegation, supervision. The nursing assistant can provide oral care to the client. This is within the scope of practice of nursing assistants. Options A, B, and D: Administering IV fluids as well as assessing and monitoring clients demand the additional education and skills of the RN. Two student nurses are assigned to a client with lung cancer who has received oxycodone (Roxicodone) 10 mg orally for pain. During the assessment, which finding should the student nurses report immediately? Option D: Delegation, supervision. A drop in respiratory rate indicates respiratory depression, which also puts the client at risk for respiratory acidosis. Options A, B, and C: All the other findings are vital and should also be reported to the RN, but the respiratory rate requires immediate attention. The client with a diagnosis of Fluid Volume Deficit is assessed by the physician. The assessment reveals bounding peripheral pulses, weight gain of 2 lb, pitting ankle edema, and moist crackles bilaterally. Which order takes priority at this time? Option A: Prioritization. Bilateral moist crackles signify fluid-filled alveoli, which interferes with gas exchange. Furosemide is a potent loop diuretic that will help mobilize the fluid in the lungs. Options B, C, and D: The other orders are important but are not urgent. Mechanical ventilation is provided to a client with respiratory failure. The blood gas results reveal respiratory acidosis. Which change in ventilator setting should you expect to correct this problem? Option B: Prioritization. The blood gas component tied to respiratory acidosis is carbon dioxide. Increasing the ventilator rate will blow off more carbon dioxide and decrease the acidosis. Change in the oxygen setting may improve oxygenation but will affect respiratory acidosis. The clinical instructor directed the student nurse to care for a client whose potassium is 6.7 mEq/L. Which intervention is delegated correctly to the student nurse? Option B: Delegation, supervision. The normal range for potassium is 3.5 to 5 mEq/L. The client's potassium level is high. Kayexalate eliminates potassium from the body through the gastrointestinal system. Option C: Spironolactone is a potassium-sparing diuretic that may cause the client's potassium level to go even higher. Option D: The beginning nursing student does not have the skill to assess ECG strips. The nursing assistant is assigned to a client with a chronically low phosphorus level. What is the best response of the nurse when asked why the client needs so much assistance with ADLs? "The client's skeletal muscles are weak because of the low phosphorus." "The client will do more for himself when his phosphorus level is normal." "The client's low phosphorus is probably due to malnutrition." "The client is just worn out from not getting enough rest." Option A: Delegation, supervision. A low level of phosphorus manifests generalized muscle weakness that may lead to acute muscle breakdown (rhabdomyolysis). Options B, C, and D: All other statements are true but they do not answer the nursing assistant's question. Which client should the charge nurse designate to the step-down unit nurse pulled to the intensive care unit for the day? Option D: Assignment. The client with COPD, although ventilator dependent, is in the most stable condition among the clients in this group. Options A and C: Clients experiencing acid-base imbalances often require frequent laboratory assessment and changes in therapy to correct their disorders. Option B: The client with diabetic ketoacidosis is a new admission and will require an in-depth admission assessment. 1. A male client is admitted for treatment of the syndrome of inappropriate antidiuretic hormone secretion (SIADH). For which electrolyte irregularity will the nurse be certain to monitor? 2. The nurse just received the client’s morning laboratory results. Which of these results is of most concern? 3. The assigned LPN of the unit reports to you that a client’s blood pressure and heart rate have decreased, and when her face is assessed, one side twitches. What is the most appropriate thing to do as a nurse? 4. A client going through intense chemotherapy treatment is admitted to the unit. Which of these would the nurse instruct the nursing assistant to report to prevent an acid-base imbalance? C. Failure to eat all the food on the breakfast tray. D. Prolonged episodes of nausea and vomiting. 5. An anxious client is rushed to your unit. The vital signs measurements include a respiratory rate of 39 breaths/min. Which acid-base imbalance should the nurse suspect? 7. A client is admitted to the unit with the diagnosis of Deficient Fluid Volume related to excessive fluid loss. Which action related to fluid management should be charged to a nursing assistant? 8. A group of nursing students is assigned to care for a client with a nasogastric tube connected to a wall suction. One student asks why the client’s respiratory rate has decreased. Choose the best response. 9. A 56-year-old male is newly admitted to the medical unit. Which factor alerts the nurse that this client has a risk for acid-base imbalances? A. The client takes antacids for occasional indigestion. B. The client gets short of breath with extreme exertion. C. The client has a history of myocardial infarction 1 year ago. D. The client has chronic renal insufficiency. 10. The monitor watcher from the telemetry units informs the assigned nurse that the client developed prominent U waves. Which laboratory value should the nurse monitor? 13. A client is admitted to the unit with the nursing diagnosis of Decreased Cardiac Output related to decreased plasma volume. Which assessment finding supports this nursing diagnosis? 15. Two student nurses are assigned to a client with lung cancer who has received oxycodone (Roxicodone) 10 mg orally for pain. During the assessment, which finding should the student nurses report immediately? 16. The client with a diagnosis of Fluid Volume Deficit is assessed by the physician. The assessment reveals bounding peripheral pulses, weight gain of 2 lb, pitting ankle edema, and moist crackles bilaterally. Which order takes priority at this time? 17. Mechanical ventilation is provided to a client with respiratory failure. The blood gas results reveal respiratory acidosis. Which change in ventilator setting should you expect to correct this problem? 18. The clinical instructor directed the student nurse to care for a client whose potassium is 6.7 mEq/L. Which intervention is delegated correctly to the student nurse? 19. The nursing assistant is assigned to a client with a chronically low phosphorus level. What is the best response of the nurse when asked why the client needs so much assistance with ADLs? 20. Which client should the charge nurse designate to the step-down unit nurse pulled to the intensive care unit for the day? Option C: Prioritization. With a magnesium level this low, the client is at risk for ECG changes and life-threatening ventricular dysrhythmias. Options A, B, and D: All of these values are also outside of the normal range, but the magnesium level is furthest from the normal values. Option C: Prioritization. Facial twitching of one side of the mouth, nose, and cheek in response to tapping the face just below and in front of the ear is a positive Chvostek sign. It is a neurologic manifestation of hypocalcemia. Option D: The LPN is experienced and holds the skills to carefully and accurately measure vital signs. 4. Answer: D. Prolonged episodes of nausea and vomiting. Option D: Prioritization, supervision. Repeated nausea and vomiting can lead to an acid deficit and metabolic alkalosis. Options A, B, and C: The other options are vital and still need to be assessed, but are not related to acid-base problems. Option A: Prioritization, supervision. The client is blowing off carbon dioxide and is most likely hyperventilating. A sudden drop in carbon dioxide will result in an increase in pH and cause respiratory alkalosis. Option B: Delegation, supervision. A well-trained and educated nursing assistant is knowledgeable in measuring vital signs and recording intake and output. Option A: Performing fingerstick glucose checks and assessing clients demands further education and skill, as possessed by licensed nurses. Option C: Delegation, supervision. Additional fluid intake can be reinforced by the nursing assistance once it is part of the care plan. Options A, B, and D: Administering IV fluids, developing plans, and educating families demand further education and skills that are within the field of practice of an RN. Option D: Supervision, prioritization. Nasogastric suctioning can result in a decrease in acid components and a metabolic alkalosis. The client’s decrease in rate and depth of ventilation is an attempt to compensate by retaining carbon dioxide. Options A and B: These responses are incorrect. Option C: This response may be right, but it does not discuss all the components of the question. 9. Answer: D. The client has chronic renal insufficiency. Option D: Prioritization. Chronic renal disease and pulmonary disease are risk factors for acid-base imbalances in the older adult. Option A: Although antacid abuse is a risk factor for metabolic alkalosis, occasional antacid use will not cause imbalances. Option B: Prioritization. The nurse should immediately check the client’s potassium level for hypokalemia. Common ECG changes with hypokalemia include ST depression, inverted T waves, and prominent U waves. Heart block may also transpire to clients with hypokalemia. Option D: Prioritization. HCTZ is under thiazide diuretics. It should not be taken at night because it will cause the client to awaken and go to the toilet to urinate. Weight gain and increased edema should not transpire while the client is using this drug, so this should be reported to the prescriber. Option A: This type of diuretic causes potassium depletion, so the nurse should educate the client about eating foods rich in potassium. Option B: Prioritization. Neck veins are usually distended when the client is in the supine position. These veins flatten as the client moves to sitting position. Options A, C, and D: These responses are characteristic of the nursing diagnosis of Excess Fluid Volume. Option D: Assignment, delegation, supervision. The nursing assistant can provide oral care to the client. This is within the scope of practice of nursing assistants. Options A, B, and D: Administering IV fluids as well as assessing and monitoring clients demand the additional education and skills of the RN. Option D: Delegation, supervision. A drop in respiratory rate indicates respiratory depression, which also puts the client at risk for respiratory acidosis. Options A, B, and C: All the other findings are vital and should also be reported to the RN, but the respiratory rate requires immediate attention. Option A: Prioritization. Bilateral moist crackles signify fluid-filled alveoli, which interferes with gas exchange. Furosemide is a potent loop diuretic that will help mobilize the fluid in the lungs. Options B, C, and D: The other orders are important but are not urgent. Option B: Delegation, supervision. The normal range for potassium is 3.5 to 5 mEq/L. The client’s potassium level is high. Kayexalate eliminates potassium from the body through the gastrointestinal system. Option C: Spironolactone is a potassium-sparing diuretic that may cause the client’s potassium level to go even higher. Option D: The beginning nursing student does not have the skill to assess ECG strips. Option A: Delegation, supervision. A low level of phosphorus manifests generalized muscle weakness that may lead to acute muscle breakdown (rhabdomyolysis). Options B, C, and D: All other statements are true but they do not answer the nursing assistant’s question. Option D: Assignment. The client with COPD, although ventilator dependent, is in the most stable condition among the clients in this group. Options A and C: Clients experiencing acid-base imbalances often require frequent laboratory assessment and changes in therapy to correct their disorders. Option B: The client with diabetic ketoacidosis is a new admission and will require an in-depth admission assessment.